Leukocytes, or white blood cells, are generally larger than erythrocytes, but they are fewer in number. Even though they are considered to be blood cells, leukocytes do most of their work in the tissues. They use the blood as a transport medium. Some are phagocytic, others produce antibodies; some secrete histamine and heparin, and others neutralize histamine. Leukocytes are able to move through the capillary walls into the tissue spaces, a process called diapedesis.In the tissue spaces they provide a defense against organisms that cause disease and either promote or inhibit inflammatory responses. There are normally between 4x109 and 11x109 white blood cells in a liter of healthy adult blood - about 7,000 to 25,000 white blood cells per drop. 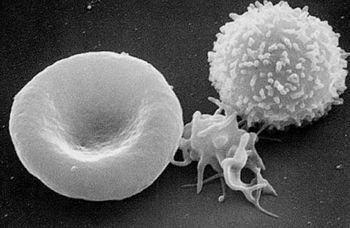 Many white blood cells are found outside the blood stream. Large numbers are found in the lymphatic system, the spleen, and in other body tissues. Those in the blood may have the ability to crawl out of blood vessels, squeezing between the cells of the vessel walls. Unlike red blood cells, the white blood cells do not contain hemoglobin. Though they are not as numerous, they are also much greater in size, posses a nucleus, and appear translucent. Red blood cells also have a short life span, where the lifespan of a white blood cell can be quite long, depending on the function of that cell. Some live a few days, dying during combat with microbes. Others can live for years. Abnormal white blood cell count is usually an indication of infection or disease. It can be a symptom, or a cause. Infectious mononucleosis, caused by the Epstein-Barr virus, forces a dramatic increase in B lymphocytes, while AIDS, caused by the HIV virus, forces an abnormally low level of T lymphocytes. Leukemia is diagnosed as a result of rapid production of abnormal white blood cells, and is a form of cancer. White blood cells show remarkable intelligence, purpose, and teamwork throughout their lifespan. Scanning electron micrograph of HIV-1 budding from cultured lymphocyte. Multiple round bumps on cell surface represent sites of assembly and budding of virions. There are two main groups of leukocytes in the blood. The cells that develop granules in the cytoplasm are called granulocytes and those that do not have granules are called agranulocytes. Neutrophils, eosinophils, and basophils are granulocytes. Monocytes and lymphocytes are agranulocytes. Neutrophils, the most numerous leukocytes, are phagocytic and have light-colored granules. Eosinophils have granules and help counteract the effects of histamine. Basophils secrete histamine and heparin and have blue granules. In the tissues, they are called mast cells. Lymphocytes are agranulocytes that have a special role in immune processes. Some attack bacteria directly; others produce antibodies. Granular leukocytes are filled with enzymes and proteins contained within spheres, for the purpose of aiding white blood cells in conflict with foreign microbes. Agranular leukocytes typically have a kidney shaped nucleus and do not house antigen containing spheres. Five different types of leukocytes exist, and are found in granular and agranular structure. Have a multilobed nucleus joined by nuclear threads. They are the most abundant of the white blood cells and are able to phagocytize and digest bacteria. White blood cells of type B and T, each playing a specific role in immunity. The largest of the white blood cells. Once they have taken residency in tissue, they differentiate into macrophages, which phagocytize microbes and stimulate other white blood cells to defend the body. ↑ 2.0 2.1 2.2 Composition of the Blood National Cancer Institute. Accessed January 3, 2012. Author unknown. ↑ White blood cell by Science Daily. This page was last modified on 30 July 2015, at 22:01.